Liberal junior point guard Katie Horyna accumulated all-state honors in three sports in the first two seasons with the Redskins. As a freshman in cross country, she earned Western Athletic Conference runner of the year and took seventh at state in Class 5A in a time of 20 minutes, 5 seconds. As a sophomore, she took 21st and ran 19:51. Horyna earned seventh in the 1,600-meter run in 5:30.47 in her freshman state track season. She also ran on the eighth-place 3,200-meter relay that finished in 10:11.53. Last spring, Horyna was 11th at state in the 1,600 in 5:47.74. In basketball, Horyna and her classmate Machia Mullens have started since their freshman years and engineered a massive turnaround. As a freshman, Horyna collected four points and 3.1 assists a game for a 17-5 squad. Last year, Horyna collected first team all-state honors with 13 points, 3.1 assists and 2.4 steals. Liberal finished 23-2, took third in 5A and captured a state tournament game for the first time since 1987. She did everything while battling severe stomach and internal pain since the beginning of her sophomore year. “My stomach really hurts really bad,” she said. This fall, Horyna missed all of cross country season, except conference and regionals. She did not qualify for state. At one time, she was on a paleo diet and has to watch her sugar intake. Horyna has seen her regular doctor in Garden City and tried multiple different medicines. This summer, she went to the well-known “Smarter Training for Faster Running” cross-country camp in Pueblo, Colorado. She met some people who used natural medicines. Horyna decided to make a change and go natural. “I tried different medicines every month, it was getting really tiring and finally during the summer, I said, ‘Nope, I am not doing this anymore,’” she said. “I have two different kinds of strep viruses in my system,” Horyna said. Horyna said the natural medicines, which are mainly available in Wichita, have helped her recover. She said it will take “a long time” to fully get back to normal. Horyna, a 4.0 student, has a long term goal to focus on health sciences and training in other countries. The interest sparked because of her health. Horyna’s role model is Elena Delle Donne, one of the most recognizable WNBA players, a former MVP and five team all-star. Delle Donne has battled through chronic Lyme disease, an energy-sapping illness. Before the basketball season started, Horyna told Liberal coach Carter Kruger that she is “probably feeling as good” as she has in years. 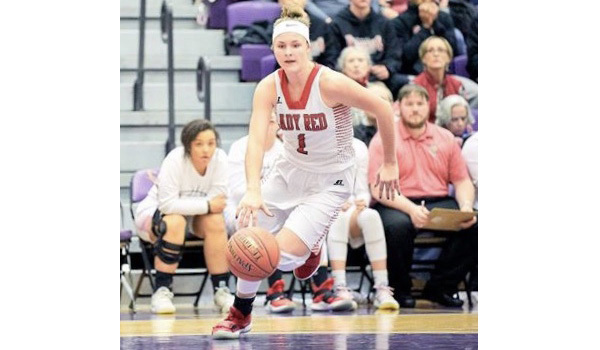 A healthier Horyna has established herself as one of Kansas’ top players for all classes on one of the state’s best teams. After back-to-back wins Friday and Saturday against Hays High and Dodge City, Liberal is 16-0 and remains No. 2 in Class 6A behind Derby. Only Liberal and Derby are undefeated in 6A. The Redskins have their best start in 43 years, according to well-known Liberal broadcaster Brock Kappelmann. Horyna has either surpassed or matched nearly all her key numbers from last season. Entering Friday, She is up to 15.6 points, 4.2 rebounds, 3.1 assists and 1.8 steals. Despite an ankle injury this winter, she earned her second consecutive MVP of the midseason Salina tournament. Earlier, Horyna was the Garden City Clarion Roundball Most Outstanding Player in December. All summer, Horyna worked on shooting and dribbling. She and Mullens played on Ohlde Elite, a well-known basketball program for top Kansas players. “When she was a freshman, people looked at her and thought it was just easy for her, but from elementary school all the way up till today, she puts a ton of effort into her game, and she is always wanting to get better,” Kruger said. Horyna has significantly cut her turnovers from three a game as a freshman and 3.2 as a sophomore to 2.1 this winter. Horyna was 21 of 58 combined on treys her first two seasons and is 21 of 46 his year. Horyna holds a scholarship offer from Emporia State coach Toby Wynn, formerly the longtime successful Seward County Community College women’s coach in Liberal. Hays High is ranked No. 10 in Class 5A, and HHS coach Alex Hutchins labeled Horyna the best player he has seen this year. Horyna, the oldest of three sisters, has long played basketball. Many of the current Liberal players have been on the same team since third grade, including Horyna and Mullens and junior Audrey Gilmore. Horyna’s and Gilmore’s fathers coached the team. This winter, Mullens averages 14.9 points and 6.9 rebounds a contest. She called her and Horyna “the dynamic duo,” and said they have a bond on the court similar to twins. Gilmore averages 3.6 points, 3.3 rebounds and 1.6 steals. Sophomore Aubrey Warden has 6.6 points and 6.5 rebounds. The Liberal varsity includes Horyna’s freshman sister, Bree. She has seen spot time on the varsity. The first time Bree came in to a game, Kruger subbed in both sisters together for a neat moment. Liberal has two seniors: Whitney Hay and Kim Alarcon. Hay, a four-year varsity player, has delivered 6.2 points a contest and is known for her 3-point shooting. She will play basketball at Bethany College. A great athlete, Alarcon averages 2.6 points and 1.8 rebounds and is headed to Barton for soccer. Before every drink break, Kruger has the team make four free throws. If it takes more than six attempts, Liberal has to run. Last year, the Redskins led the state in free throw shooting percentage at 73 percent and rank sixth this year at 67. Liberal had encountered a downturn after a 21-2 season with former coach Shane Stout – now at K.C. Piper – in 2008-09. After a 12-9 season in ’09-10, Liberal won nine, three, four, seven and four games. Previously, Kruger served as the Barton women’s coach and went 52-41 in college. Wynn called Kruger, who told him Liberal had strong talent at the high school level with Jada Mickens. After a successful career at Liberal, Mickens has tallied back-to-back double figure scoring seasons at powerhouse Hutchinson Community College. Plus, Wynn told Kruger about the talented middle school group with Horyna and Mullens. Liberal went 11-9 before the 17-5 breakout season two years ago. “As freshmen, we knew that we didn’t want to lose those games anymore, and the program started building up with Whitney and Kim,” Horyna said. The 6-foot Mullens has tallied double figures in all but one game this year. For her career, Mullens has delivered 11 points, seven rebounds and two blocks a contest and has exceeded 700 points. “She’s a really, really versatile player, and when she puts her mind to something, she gets really good at it,” Kruger said. “We talked about how hard Katie works. Machia can match her for effort on that. She’s really progressed a lot in her game, and then that shows out. Ohlde, a former standout at Clay Center and Kansas State, coaches at Bethel College in Newton with her husband Drew. They run Ohlde Elite in Newton and also in Clay Center. Liberal is 220 miles one-way to Newton, and Horyna and Mullens would occasionally drive midweek for practice. In the summer, they made the 301-mile trip to Clay Center for summer training weekends where they played basketball up to 10 hours a day. Horyna said she “loved” playing for Ohlde, and went to tournaments in Louisville, Dallas, Kansas City and Wichita. Monday through Thursday in the summer, the Liberal girls have weights and then have drill work for 90 minutes a day. They focus on a variety of areas, including shooting and coming off screens. Plus, the work allows the girls to develop variety in their games when facing their teammates. This feature is presented by Ohlde Elite. Best of luck to our very own Katie Horyna this season. We are proud of you. Ohlde Elite is a Basketball SKill Development Academy and Elite Club Girls Basketball Program ran by former KSU star and WNBA player NIchole Ohlde. For more info: 785-317-3295 or Follow @Ohlde_Hoops on Twitter. We absolutely do, we are currently ranked 2nd in 6A behind Derby. We have a core of girls that have played a lot of ball together for a very long time. I am quick and long for a point guard and I love to run. I have worked really hard on my shooting so I can drive or shoot the 3. We have great community support. Lots of fans at the games and if they can’t make it they all listen on the radio, we are lucky to have a great broadcaster Brock Kappelmann who is invested in our schools. You can’t go anywhere in town without someone asking you about the game or team. We play well as a team. In three of our games this year all five starters have made a 3 that is pretty unusual. We like to push the ball and our team is constantly being complimented by other schools for how hard we play. Strengths are my quickness and ability to get to the rim. Transition and scoring in the open floor Weakness: Coach Kruger would say my weakness is dribbling from side to side and not changing directions enough. My favorite thing about basketball is TEAM. I love how one day you might not being playing your best but a great team finds a way to pick you up. I also love being in the gym. I love shooting by myself and working in the gym. The other part about basketball I love is the competition. I love to beat the person I am guarding on both ends. I run Cross Country and Track. Cross Country I was 7th in 5A my freshman year. I run the 800M and 1600M in track and I have made it to state both years in the 1600M. I love how those sports push me to see what my limits are. Coach Kruger I love to play for this guy. He is very detailed and organized as a coach because he was head coach of Barton County Juco for 3 years. He has high expectations and very demanding too he will push you to do your very best at all times. But he is so funny and we love to give him a hard time too. We have practice/open gym all summer. We play in an area summer league and traveled to two team camps last summer, Pitts State and OSU. We also have a time to work out in the weight room as well. Almost all varsity players also played on different travel teams as well. It really helped us develop different roles than what our role on HS team is. I have communicated with a number of different coaches. As of now I have no plans other than I want to play basketball at the next level. I am a teenage kid, I like to eat good food, hang out with my friends, and sleep. I also enjoy traveling around and seeing different things. I will be like working in the area of health sciences, but I will travel to other countries to be trained. I love sports so I will likely be involved with coaching and training. I am 4.0 GPA, National Honor Society, Student Council, Fellowship of Christian Athletes FCA, and my favorite subject in school is math. Elena Delle Donne she has had some health issues that really resonate with me. Her competitiveness and how she absolutely wants to always win and be the best. She is very family oriented and she is always trying to help give back. I was slimed on the TV show Figure it Out on Nickelodeon when I was 10 years old. They flew me out to California, and I filmed the show.